If you hate to throw away that first calf and would like to have one that you can still sell but don't have to stay up all night worrying about, then Grizzly is the answer to your calving ease troubles. 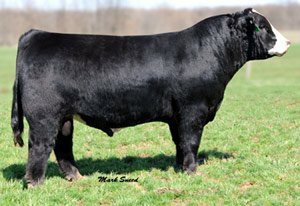 This is a maternal sire that brings a lot to the table. He has hair, bone, look, squareness, soundness, and an extended family tree of baldies on both sides of his pedigree. This photo was taken at 2 years of age, so make your own decision on how you want your maternal cattle to look at that age.